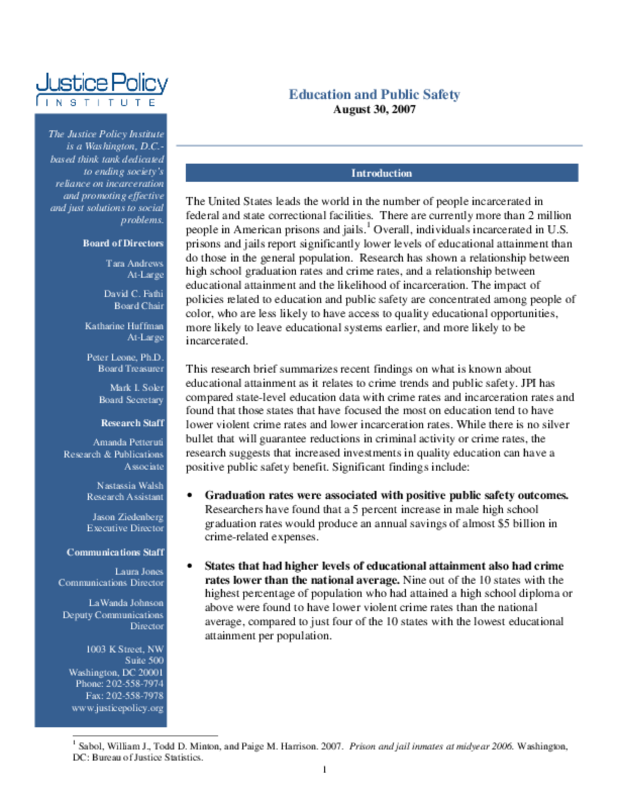 "Education and Public Safety," one of four briefs, finds that states that invest more in education have lower rates of violent crime and incarceration. The upcoming briefs will examine the intersection of policies on housing, employment, and drug treatment with safety and crime rates. Graduation rates were associated with positive public safety outcomes. Researchers have found that a 5 percent increase in male high school graduation rates would produce an annual savings of almost $5 billion in crime-related expenses. States that had higher levels of educational attainment also had crime rates lower than the national average. Nine out of the 10 states with the highest percentage of population who had attained a high school diploma or above were found to have lower violent crime rates than the national average, compared to just four of the 10 states with the lowest educational attainment per population. States with higher college enrollment rates experienced lower violent crime rates than states with lower college enrollment rates. Of the states with the 10 highest enrollment rates, nine had violent crime rates below the national average. Of the states with the lowest college enrollment rates, five had violent crime rates above the national average. States that made bigger investments in higher education saw better public safety outcomes. Of the 10 states that saw the biggest increases in higher education expenditure, eight saw violent crime rates decline, and five saw violent crime decline more than the national average. Of the 10 states that saw the smallest change in higher education expenditure, the violent crime rate rose in five states. The risk of incarceration, higher violent crime rates, and low educational attainment are concentrated among communities of color, who are more likely to suffer from barriers to educational opportunities. Disparities in educational opportunities contribute to a situation in which communities of color experience less educational attainment than whites, are more likely to be incarcerated, and more likely to face higher violent crime rates. Copyright 2007 Justice Policy Institute. All rights reserved.